EDMONTON – Mike Reilly and the Edmonton Eskimos felt right at home in a 40-24 victory over the Montreal Alouettes on Saturday night. The win marks the Green and Gold’s sixth victory of the season and their fourth coming on home field. The Eskimos’ quarterback had the ball slinging around on offence early in a game that was in question of even being played due to the air quality surrounding Edmonton due to the numerous forest fires ravaging through the neighbouring province of British Columbia. Despite the Als’ defence putting pressure on Reilly all night, five sacks wouldn’t be enough to stop him from putting forth a MOP-caliber performance all night long. The Eskimos quarterback finished the game completing 33-42 passes for 424 yards and three touchdowns, while also adding a major on the ground. Sean Whyte opened the scoring on Edmonton’s opening drive of the game with a 38-yard field goal. Antonio Pipkin became the sixth starting quarterback for the Alouettes this season after Johnny Manziel went under concussion protocol earlier this week, placing the quarterback on the one-game injury list ahead of their trip to Edmonton. Edmonton’s head coach Jason Maas gave fair warning of the speed that Shaq Cooper brings to the Eskimos’ offence ahead of his first CFL start, and there was no delay in seeing just what Maas meant as Cooper broke loose in the first quarter, breaking a run to the sideline for a 24-yard gain. On the following play, Mike Reilly would find Cooper, connecting in the flat and letting Cooper scamper and diving into the end zone for his first CFL touchdown. With the touchdown pass, Reilly passed Tom Wilkinson on the Eskimos all-time passing touchdowns list with 131. Starting with positive field position after an attempted pooch-kick, Antonio Pipkin moved the ball upfield in a hurry with a 40-yard completion to Eugene Lewis, eventually leading to a 4-yard scoring run three plays later to narrow the Edmonton lead 10-7 with under three minutes left in the opening quarter. Mike Reilly went up over 100-yards passing by the end of the first quarter, thanks in large part to a 40-yard completion to Bryant Mitchell on a simple designed route across the middle of the Alouettes defensive coverage. 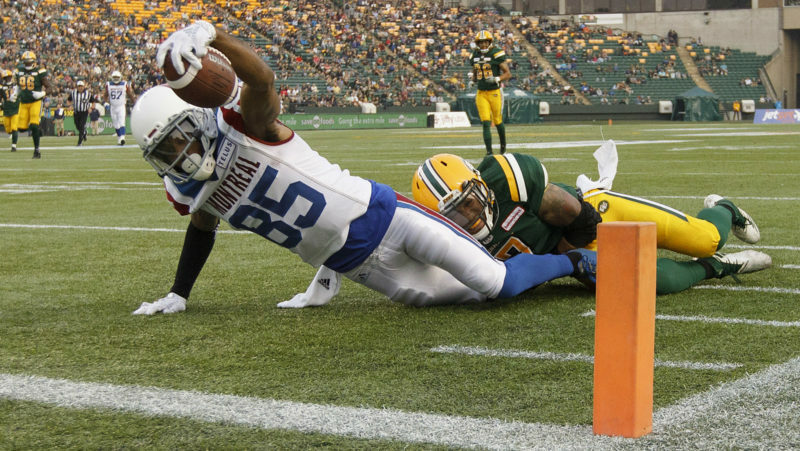 The Eskimos further extended their lead in the second quarter as Reilly got the league-leading connection with Duke Williams underway, finding his top-target in the corner of the end zone after creating some separation from Alouettes’ linebacker Chip Cox. Montreal showed some perseverance in the first half, however, not to let the Eskimos slip away as Pipkin made his statement by connecting with B.J. Cunningham on a pass play that brought Montreal down to the one-yard line. The Als’ quarterback would go on to plunge ahead the following play to score a touchdown, cutting into the Esks’ lead and recording his first career touchdown in the process. Despite the Eskimos offensive line giving up three uncharacteristic sacks in a row, undisciplined penalties after the play kept Reilly and the offence inching closer to scoring position, eventually leading to Reilly tossing up a ball that found its way into the hands of Bryant Mitchell for Reilly’s third touchdown pass of the day, pushing the score to 24-14 for Edmonton. Mitchell had six receptions in the first half, topping the century mark with a total of 111 yards and the touchdown. By the end of the game, a Dark Knight of the Eskimos’ receiving corps, Mitchell totalled a team-high 128 yards on seven receptions. Bookending the Eskimos’ first-half scoring, Sean Whyte notched a 49-yard field goal attempt with 38 seconds remaining in the second quarter, capping off a half that saw the Eskimos combine for a total of 344 yards on offence. In the final seconds of the second quarter, Montreal’s Adarius Bowman and Edmonton’s Mercy Maston were handed game disqualifications after the two engaged in an altercation during the previous play. As the game reached halftime, Reilly completed the first half with 290 passing yards and completing 88.5 per cent of his passes. Meanwhile, for Antonio Pipkin, the Alouettes quarterback completed seven of his 11 pass attempts in the opening 30 minutes of play, reaching 107 yards through the air. Sean Whyte chipped his third field goal of the night halfway through the third quarter, splitting the uprights from 35 yards out, further extending the Eskimos lead over the Als 30-14. A Boris Bede punt gave Montreal a single on the following drive. Up by slightly more than two touchdowns, the Eskimos elected to operate a conservative offence with quick passes and utilizing the shiftiness of Shaq Cooper to gain yards on the ground. Early in the fourth quarter, Whyte continued his perfect outing with his fourth field goal. This time, a 20-yard boot boosted the Eskimos lead to 18 points less than two minutes into the final quarter at Commonwealth Stadium. Als’ veteran running back Tyrell Sutton was carted off of the field following an apparent lower-body injury, saluting the crowd as the fans in attendance applauded the six-year back as a sign of respect. Esks’ running back Shaq Cooper continued to show off his speed late in the fourth quarter as he took the ball down to the one-yard line as he approached a 100-yard performance on the ground. The following play, Reilly dove for his eighth rushing touchdown of the season, putting his squad up 40-18. Antonio Pipkin and the Als pieced together a pair of big gain plays, including a touchdown pass to B.J. Cunningham to keep things interesting in the winding minutes of the game. The pass became Pipkin’s first CFL passing touchdown and Cunningham’s second touchdown reception for the season. Up next for the Eskimos, they’ll travel to Hamilton to take on the rested Ticats who will be coming off of a bye week ahead of Week 11. The last meeting between the two teams saw Jeremiah Masoli and the Ticats defeat the Esks 38-21 at Commonwealth. That game kicks off the week’s schedule on Thursday with a 7:30 p.m. ET kick off from Tim Hortons Field. As for the Alouettes, they will take on the Toronto Argonauts the following night as the Double Blue are coming off of their second straight come from behind win – a 24-23 victory over the Lions.